Our Community Cafe is open Tuesdays, Wednesdays, Thursdays, and Saturdays. 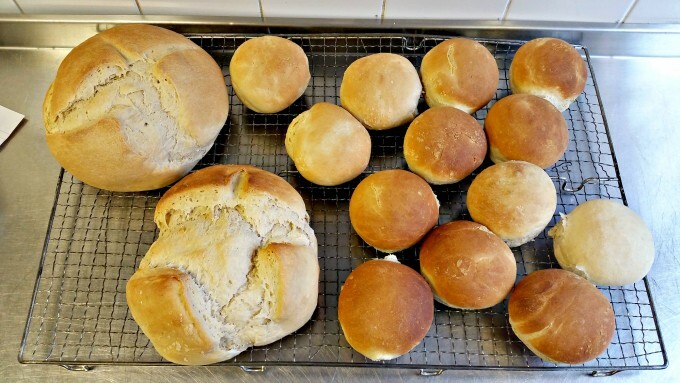 Recently it has opened its doors on Mondays for volunteers who are interested in baking; specifically – bread and rolls. Welcome to our very own Community Bakery. 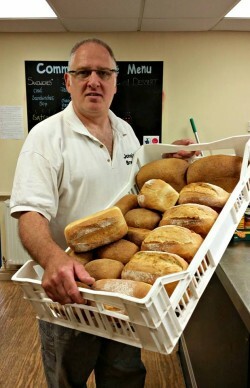 John Saunders holding a crate of loaves – warm, soft and fragrant – straight out of the oven. As some of you may remember, a very kind professional baker who goes by the name of John, has started bringing in a couple of crates of freshly baked bread every Tuesday morning since last August. He never fails to donate for us a big batch of freshly baked goods, every Tuesday morning, which makes our kitchen smell heavenly. This summer John has collaborated with our Community Cafe’s Laura, as they came up with an idea to help our volunteers increase their confidence and develop new skills. John has agreed to share his expertise free of charge with our volunteers. 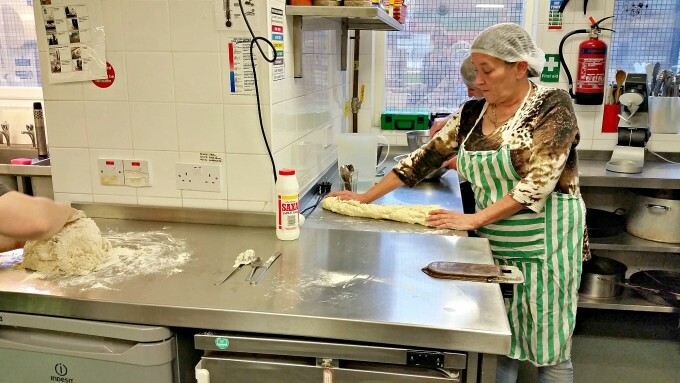 Laura is overlooking the process and liaising with businesses who would possibly be interested in purchasing freshly baked bread, kneaded and shaped by our volunteers’ fair hands. This is how Community Bakery was born. 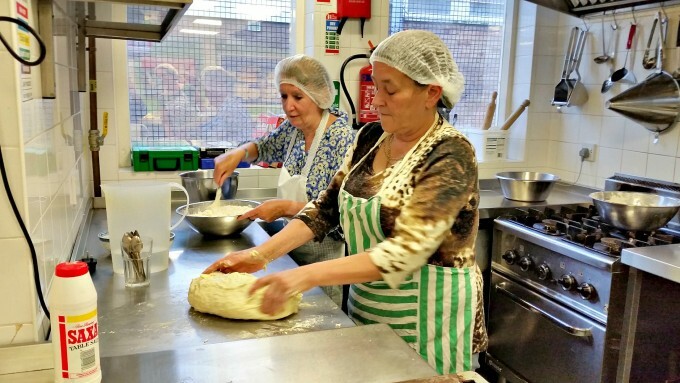 Our long-time volunteer Gail stretches the dough. The main aim of this brand new project is to tackle social problems through practical involvement and skill honing activities, improve communities, people’s life chances, and the environment. The volunteers sell the baked goods, however, they reinvest their profits back into the business or the local community. This way, we’re hoping The Community Bakery becomes a self-sufficient project, which will hopefully, keep on operating in the years to come. If you’d like to get involved, please contact Laura on laura.budd@thefoxtoncentre.co.uk or call 01772 555925 and ask to speak to Laura. It’s bread week every week. Lighter loaves is regular bread; darker loaves are gluten free.